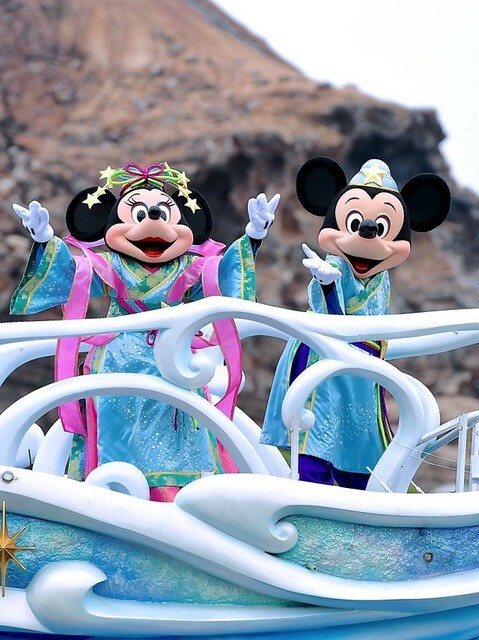 Today officially marks Tanabata, a uniquely Japanese festival of Chinese origin and is one of the few events at Disney that wholly showcases Japanese culture. Also known as the “Star Festival“, Tanabata is a Japanese holiday celebrating the romantic meeting of star-crossed lovers Vega (Weaver Star) and Altair (Cowherd Star). The name “Tanabata”, 七夕 in Japanese, literally means the “Seventh Night”, aptly named because the two lovers can only meet once a year on the date of July 7th, ie. the seventh night of the seventh month. 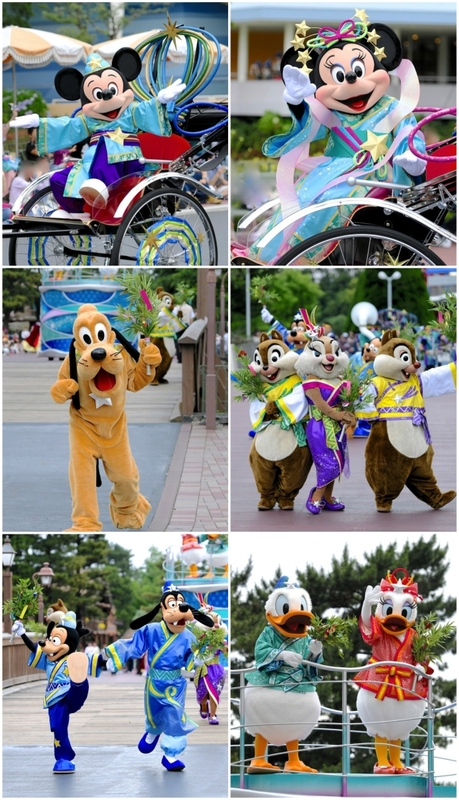 Tokyo Disney Resort celebrates this short-lived event for only one week starting July 1st. Easter, Christmas and Halloween carry several Western themes but New Year’s, Summer Festival, and Tanabata Days are meant to symbolize the uniqueness of the local culture of Japan. What this means is that for one week, we will be able to see Disney characters adorn traditional Japanese style clothing which will undoubtedly make for a very interesting presentation. Mickey will be representing Hikoboshi (Altair) and Minnie as Orihime (Vega) based on the Japanese folktale of the lovers. Some of the prevailing themes involve stars, kimonos, and bamboos. Park guests can follow the theme in wearing kimonos or yukatas to the park. There is even a wishing place where guests are able to write their wishes on a small card and hang it up for display. Here we take a look at the show and parade celebrating this romantic Japanese festival. 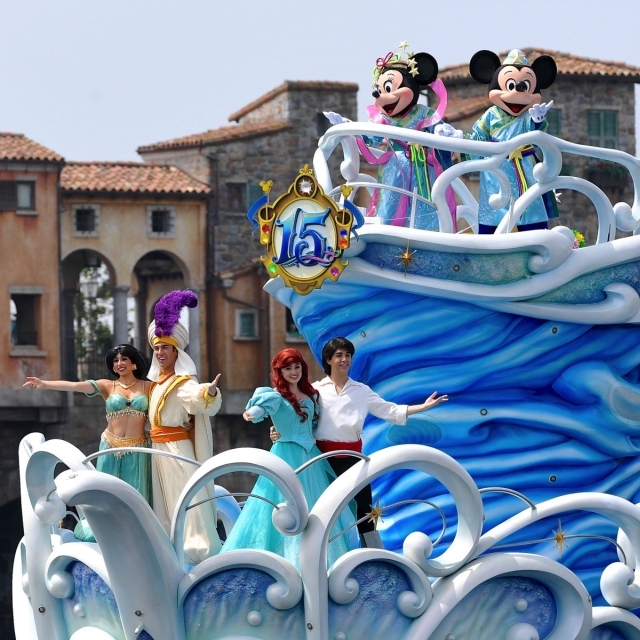 The 10 minute greeting show takes place in Mediterranean Harbor featuring key couples representing the themed lands. Mickey & Minnie for American Waterfront, Ariel & Eric for Mermaid Lagoon, and Jasmine & Aladdin for Arabian Coast. Mickey as Altair and Minnie as Vega. Representing Arabian Coast and Mermaid Lagoon. Note the 15th Anniversary crest adorning the ship’s upper deck. 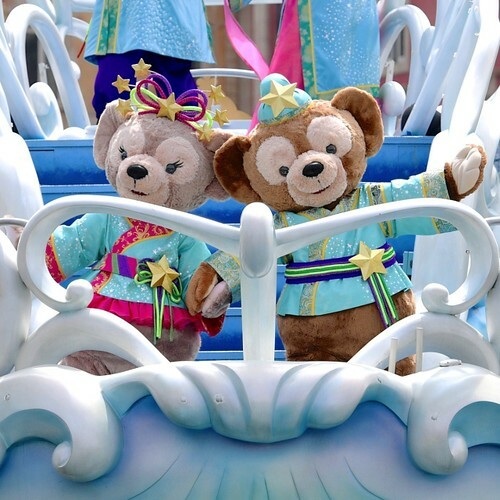 With couples as a dominant theme, Duffy and Shellie May also make an appearance. Wishing love will come to you too. Now for Disneyland. 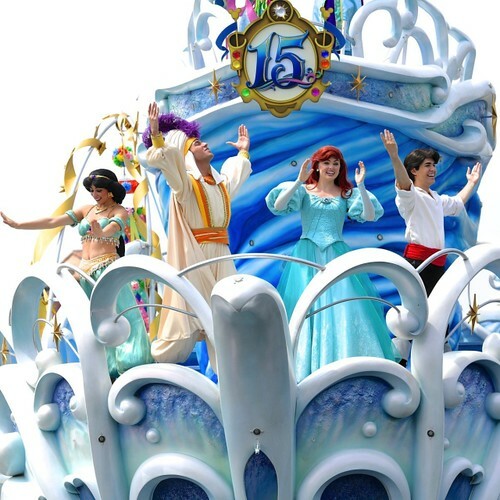 The parade features more couples and characters since space is not limited to a single boat. Starting off the parade is Mickey and Minnie arriving in rickshaws. Followed by Max and Goofy, Clarice with Chip and Dale, Donald and Daisy, and finally a handful of Princesses with their respective Princes. 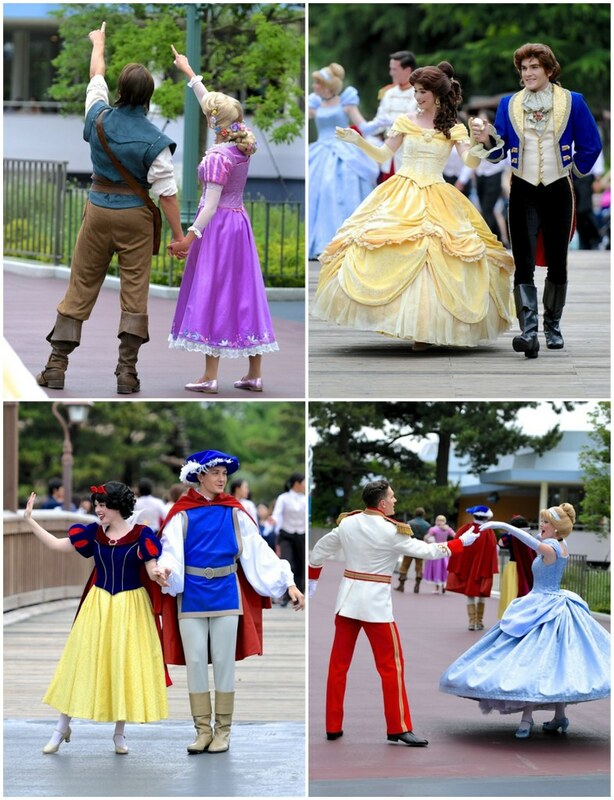 Rapunzel and Flynn, Snow White and Prince Ferdinand, Cinderella and Prince Charming. It’s especially a rare treat to see Belle and Prince Adam appear! 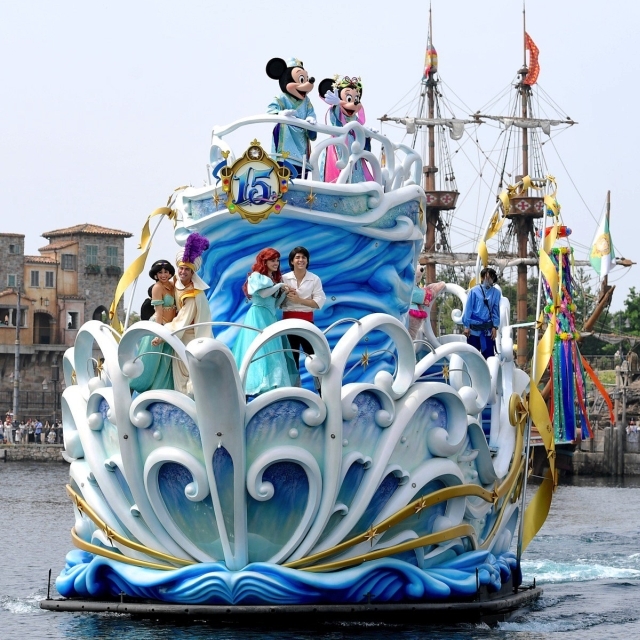 All images credited to MezzoMiki for Disneyland and DisneySea.